The last few years haven’t been kind to journalists. The decline in print journalism has led to the decimation to the 20th century model of news creation whilst their standing in the public’s eyes has fallen to levels usually reserved for MPs and lawyers as phone-hacking revelations continue to destroy the industry’s slender claims to ethical credibility. However they continue to soldier on, harbouring a dewy-eyed nostalgia for behaviour of the sort that would not be acceptable in other line of employment. Against it all journalists continue to cling to the iconic image of the noble, incorruptible news reporter – immortalised many times on screen and in print – and try to square it with the reality of a culture of bullying and humiliation that – to outsiders – seems endemic to the profession. These tensions are evident in Mark Jagasia’s scabrous satire Clarion. 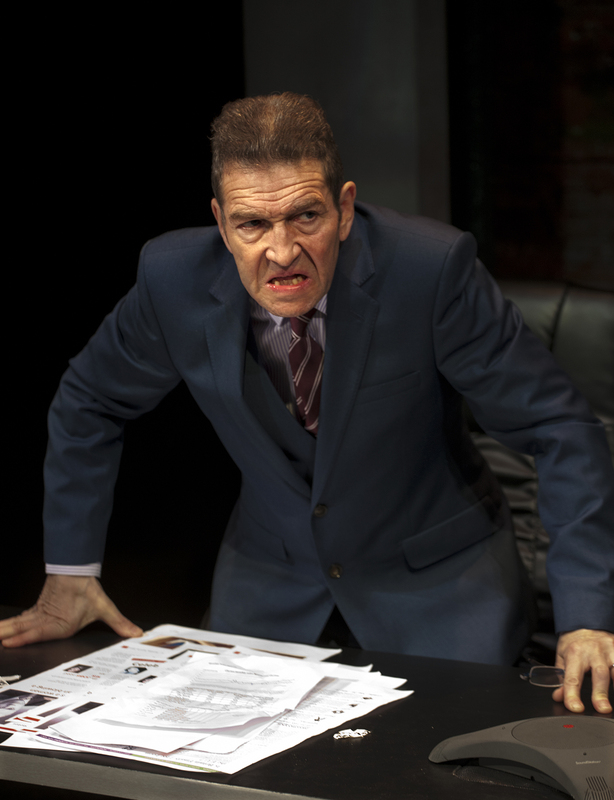 Jagasia, who worked for the Evening Standard and the Daily Express, has written a play fuelled with an intimate knowledge of its subject that is brutally scathing about the news industry, gut-wrenchingly funny in parts, but that can also be seen as a love letter to a dying friend. Technology has left the medium wobbling on its last legs. It is likely there will be people watching this play that have never paid for a newspaper. Even the idea of a front page splash is fading as people see news as a series of equally sized tiles on mobile phones. The profession survives but it is a shadow of what it was, and it is hard not to feel that Clarion carries with it the faint note of a eulogy. For as much as this is a comedy, it is impossible to ignore the artful nods towards Greek tragedy. It broadly adheres to the unities of time, action and place – taking place across a single day in a newsroom that is coming under increasing siege – and we see characters undone by their own hubris, whilst the modern day god of Mammon sows destruction among the just and unjust alike. Jagasia even skilfully incorporates a Tiresias-like seer in the form of a prescient horoscope writer. That these allusions work and don’t come off as pretentious is due to Jagasia’s skill as playwright. It is a very impressive debut and, by taking time to reveal its true depth, leaves a final impression of a play that displays a far greater degree of complexity than Richard Bean’s Great Britain. Where Great Britain was a very broad satire, and incredibly funny at times, it never scratched the surface of the issues it portrayed. It preferred caricatures to characters and one never got the sense that in reality these cartoons are actual human beings. Clarion may appear to cleave to similar stereotypes but, by limiting the cast to six core roles, Jagasia has time to add extra elements that give humanity to his creations. Small touches they may be but one senses the reality in them. It is the news editor with a half a mind on curry club, or the immigration reporter who recognises the dissonance between his career and his beliefs. Most importantly Jagasia has created a magnificent role in the form of the paper’s editor, Morris Honeyspoon. Rather than fall back on the cliché-ridden figure of legend, Honeyspoon exhibits a fierce intelligence that underpins his ranting. It is the hidden secret of tabloid journalism that those who work there tend to be very bright, well-educated individuals, and one senses Honeyspoon is as capable quoting Augustus Caesar as he is reflecting the same belief that society is collapsing due to a lack of sufficient moral rectitude. Honeyspoon is a natural conservative, an heir to Edmund Burke’s ideals, and passionate about retaining a sense of Britishness. He may espouse extreme views but this is more due to a deep-seated love for a country that he fears is changing than it is out of genuine hatred. It is sport among the liberal left to demonise those willing to air such unfashionable views and Jagasia has done superbly to create a necessary humanity for the audience to identify with even if they don’t agree with the sentiment. He may be a monster but like Frankenstein’s creation we cannot hate him for it. The play is well served by an extremely strong ensemble cast. Ryan Wichart, who was also very impressive in Shrapnel, shines as Joshua Moon, fresh-faced immigration reporter caught in the prongs of an ethical dilemma, whilst Jim Bywater has a ball as the sentence-mangling news editor resplendent in red braces and clearly a survivor of many a print-room cull. However the coup was in landing Greg Hicks and Claire Higgins in the central roles. These are top-drawer actors and to see them in the intimate space of the Arcola is a real privilege. 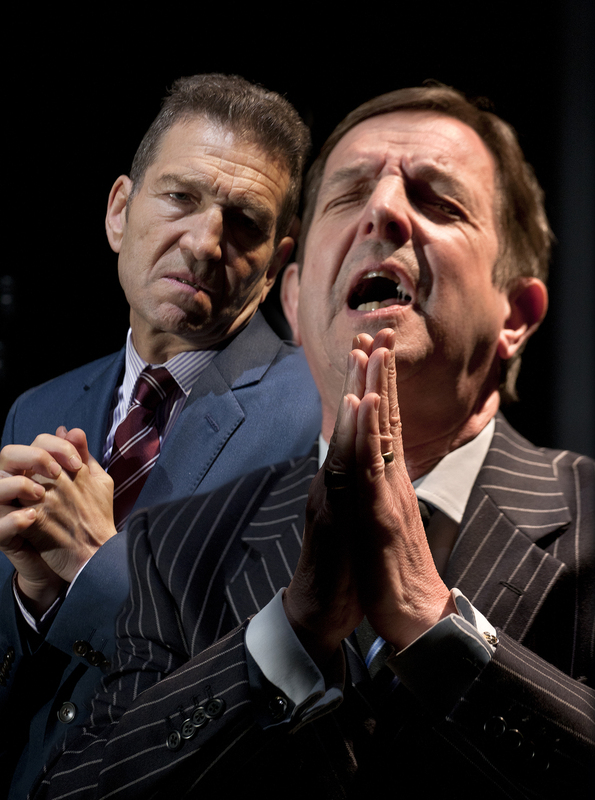 Higgins is a triple Olivier Award winner and Hicks is one of our finest classical actors. Both appear to be relishing the chance to shine in a new play and have given themselves over to the role. 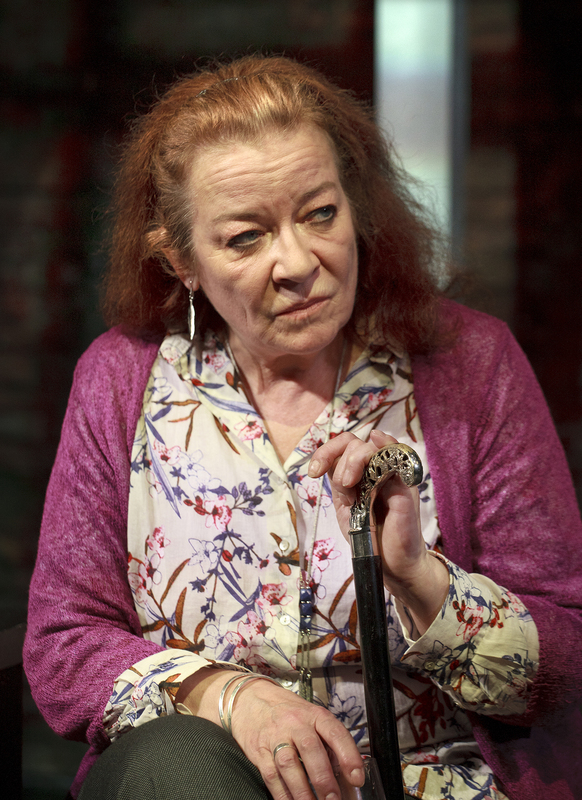 Higgins has the slightly more thankless task as she has to hold the moral centre of the play and as a result restrains herself. Yet one gets a real sense of the complexity of the old, roving reporter who must try and align themselves with the new realities. Higgins brings a quiet grandeur to the role; a sense of moral authority that is curbed by an awareness of how any such claim to the high ground can leave one open to the charge of hypocrisy. As Morris Honeyspoon, Greg Hicks is, quite simply, superb. His natural intensity may previously have masked his potential for comedy. Here that intensity is directed towards a performance of unrelenting comic energy; it is furiously performed and Hicks completely inhabits Honeyspoon. It is a masterful demonstration of acting with the whole body. It isn’t just a voice and a face; it is a performance that stretches from the end of his fingers to the tips of his toes. Hicks brings to the role the same dominance that he takes to Shakespeare; he gives Honeyspoon the tragic inflexibility, the inability to bend on a moral principle, that could be seen in his Coriolanus or his Lear. It is the total commitment of a first rate actor giving a character every chance to breath. He dominates proceedings and is helped by some brilliant set-piece speeches. Jagasia has a real flair for the comic and enjoys the rare skill of being able to combine high wit and low farce in the same sentence. Hiding within the broad farce is a highly literate play with a range of references that Tom Stoppard or Nick Payne would be proud of. Replicating comedy is notoriously hard to do but the line “Hampstead Heath! Wandering round a homosexual wilderness surrounded by Keynesians […]” is a fine example of Jagasia’s ability to mix base-humour with high culture. He also demonstrates the tabloid journalists love of word-play; the following line, delivered in a superb dead-pan by Bywater’s Duffy, is one of many perfectly crafted lines that litter the play – “You clearly do not understand the levity of the situation”. Clarion is a very impressive debut play. It avoids the sense of being overworked whilst remaining tightly written. If the overall plot struggles to emerge in the first half, it builds an inexorable momentum that leads to genuine sense of tragedy. This very solid base is lent extra weight through the superb performances; they turn Clarion into something worth catching before it inevitably transfers to the West End.